This is a unified group: Relentless Corpse Sect and the Golden Way combined their interests. 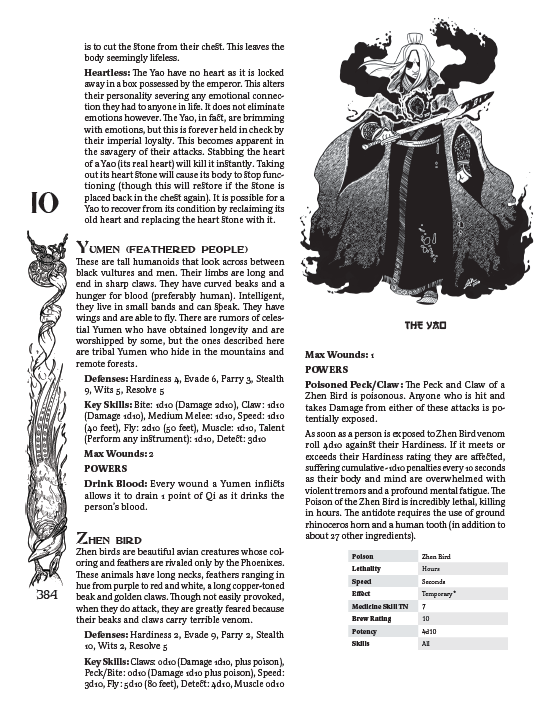 Relentless Corpse Queen and Iron God Meng are joint chiefs of the sect, and below them are the player characters via Crocodile Sect. Most of the party was in the Yellow Forest, while Chao Feng remained in the Broken Lands of Yao with Blue Handed Snake. Chao Feng left the broken lands and went to Yun Hu, where he investigated a Gambling Hall called Stone Palace. He found the leader of the hall and, after spending some time at one of the gaming tables, sat down next to him. This greatly angered the man, whose was known to the men at the table as Gambling Butcher. Chao Feng offered his services. But Gambling Butcher was insulted by his casual behavior and told him he'd consider a private audience on one condition: that he go to the Antique Guild and get the 2 million spades they owed him. Chao Feng said he would do this, then left to find information on his allies. He stopped at a steamed bun vendor to get news from a member of the House of Paper Shadows. The man handed him a bun and said "Fearless Cat wants her son", then he told him that his companions probably went to Guan Villa. So Chao Feng headed there. On his way to the villa, Chao Feng saw a tree with three faces up it and outstretched, branch-like, arms. It said "We will kill you father", and ran after them. Chao Feng and Blue Handed Snake ran through the forest toward the villa and evaded the creature. In the Yellow Forest the rest of the party were on their way to Master Guan's Villa, which they had heard was recently abandoned. They came hoping to pillage the worldly goods Master Guan had left behind. On their way they spotted a man hiding on a tree branch. They talked to him, learned his name was Bao and that he was the servant of an Antique Merchant from Fan. He had been sent to recover some items from the villa but ran into something terrifying in the woods and ran. He was hoping to find a group of people like the party that would allow him to tag along and maybe grab one or two minor objects to take to his master. With considerable reluctance they allowed him to join them and they headed for the villa. There they found a crack in the western wall and went inside to explore. Ruomei and Shen Chun went first. They came upon an enclosed garden (the villa was a courtyard house) with a stagnant pond and some halls. A giant arm seemingly made up of entwined corpses thrust out from the water and reached for them. Shen Chun used his iron thread to entangle the creature, while Ruomei used her claws to slice at it. They were able to destroy it and the others soon entered after them. 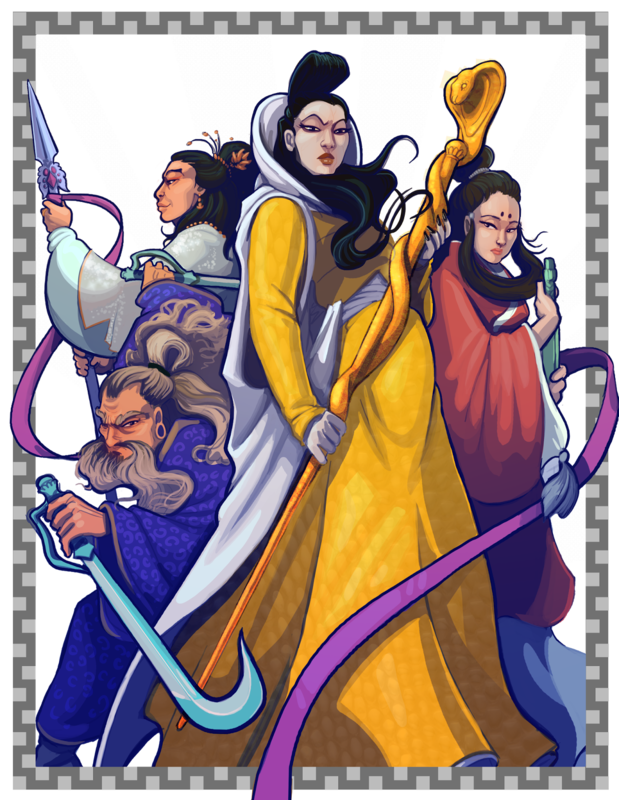 Ruomei, Li Sou Chao, Golden Roc and Hidden Arrow explored the northern hall. On their way they saw blood upon a stone table, at least a month old. They came to a reception hall that was in a state of tremendous disorder. Chairs were broken in pieces on the ground. In the hall they found a bedchamber, with a canopied bed. They flicked a piece of wood at the canopy to lower it, and a headless corpse sprang from the bed to attack. The floating head of a woman, presumably belonging to the body, attacked them from behind. A bite from the create not only wounded Hidden Arrow but drained his health (Hardiness). Ruomei used her claws, while Li Sou Chao blasted the creature in the chest with her black claw technique. As the creature attacked, Ruomei rushed to the bed and burst open the cabinet, where she found a bunch of ripped letters expressing heartache for a person named Liu. Golden Roc delivered a potent fist strike and the creature vanished. It then immediately appeared in the courtyard where the rest of the party was and they were forced to contend with it as well. They were able to defeat it, and once again it disappeared. After it was destroyed, they explored further and found a treasury near the northern hall. In the treasury they found millions of spades in chests, a jade statue of Hen-Shi, the Book of the Ghostly Emperor, and a crown from the Era of the Five Dragon Emperors. There was also a sword made with a diamond blade on a holder. Bao Yang grabbed the sword and his body flooded with rage. He immediately began to attack everyone in the room, cleaving Golden Roc in the chest. Shen Chun restrained him with his iron thread and they waited for the rage to fade. When Bao Yang came to, he threw down the sword and Golden Roc punched him in the head. They exchanged words. Bao Yang said the sword took control of him, and Golden Roc said it wouldn't have done so if he wasn't so weak-willed. They calmed down and continued their search. In the kitchen, Hidden Arrow found an unusual quantity of hellebore. They decided to leave the place before the headless woman returned but as they were dragging the crates of spades from the courtyard they discovered a group of three men outside, and one of them leveled a bow at Bao Yang. He told them to hand over all the treasure, or he'd fire. Bao Yang tried to talk him out of it, but one of the men opened his hand and blew a cloud of powder into his face. Whatever it was didn't have the desired effect and a battle commenced. Bao, the servant of the antique dealer, immediately attacked Li Sou Chao the moment the melee ensued. In the end the party overwhelmed their attackers and threatened to kill them. The leader of the group said they were all brothers and called the Roaming Avengers, that Bao was one of them. He asked to be spared saying they were only stealing treasure because they needed to raise ten hundred million spades (an impossibly large sum) to see their father again. They were sparse on details but it seemed they had been kicked out of their family house and told never to return or claim to be their father's son until they made ten hundred million spades. This did little to move anyone in the group, so they then offered their services as skilled robbers if they were spared. Hidden Arrow chose to spare them and they began calling him 'chief'. They left for Yun Hu and met up with Chao Feng on the way. He told them that he had gone to Bone Breaking Fortress but that the current leader did not acknowledge him and that there was a fight. He told the party that during the battle they were unable to harm him and he came back days later, taking the immortal killing sword by deception. He then presented them with the blade. 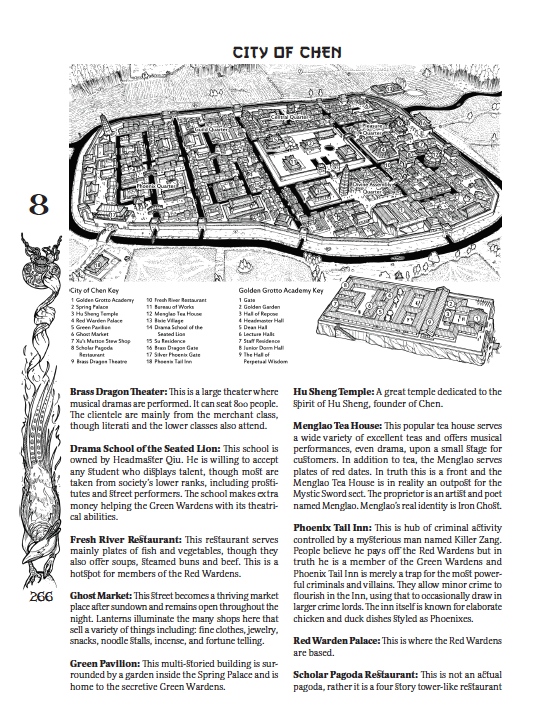 When they reached Yun Hu, the group went to the Antique Merchant Guild to recover the money for stone palace. On the way they happened by a shadow play about a cat looking for her baby, and killing any creature that stood in her way. They took this to be a message from the House of Paper Shadows. At the Antique Guild they tried to sell their stuff, and were offered a little over a million spades. Then they spoke with the chief about the two million that was owed to Stone Palace. After learning that the head of the guild controlled the Dancing Scorpions (a criminal network) they came upon an arrangement where they promised to kill Gambling Butcher for two million spades. They took the two million, which they insisted upon upfront, and went to Gambling Butcher. They showed him the money and they gave him a private audience. They went into a room in the back and up several flights of stairs where Gambling Butcher took a seat at a table surrounded by guard. As they spoke, Hidden Arrow struck Gambling Butcher with a poisoned needle. Bao Yang demanded that he give them the deed to the gambling hall. Once he realized he was going to die in moments if he didn't get an antidote, Gambling Butcher agreed. However Bao Yang kept pressing and said he wanted him to take them to Yun Hu Bank and give them all his money. Gambling Butcher accepted the demand, but one of his guards shouted with anger and leapt at the party with her sword. Horror and wuxia come together, with a hefty dose of gore, in the Bloody Parrot. Here is my video review of a surprisingly good movie. We just released Wandering Heroes of Ogre Gate as a pay-what-you-want PDF (HERE). We should have the print released sometime around September-October. For those who are curious what it is all about here is a brief preview. 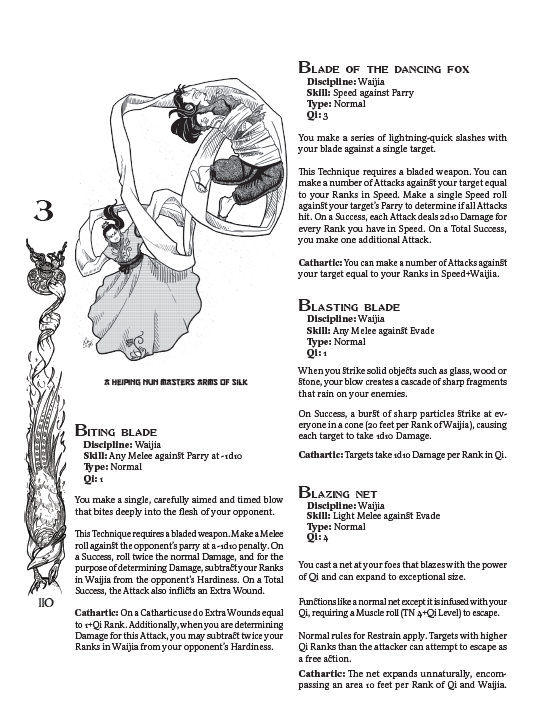 What Is Wandering Heroes of Ogre Gate? 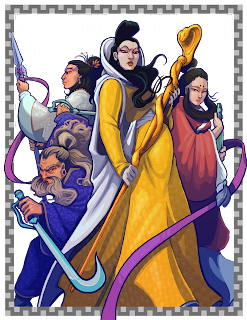 Wandering Heroes of Ogre Gate is a wuxia RPG set in a fantasy world of feuding sects and martial heroes fighting in the shadow of a corrupt and powerful empire. 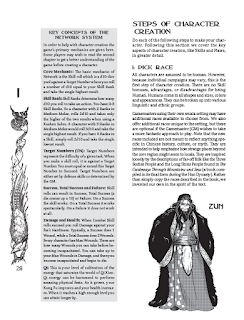 The game comes with over 180 Kung Fu Techniques and complete rules for running a wuxia campaign. 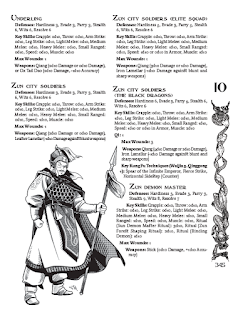 Make your martial hero by selecting skills, kung fu techniques, martial disciples and choosing your sect. 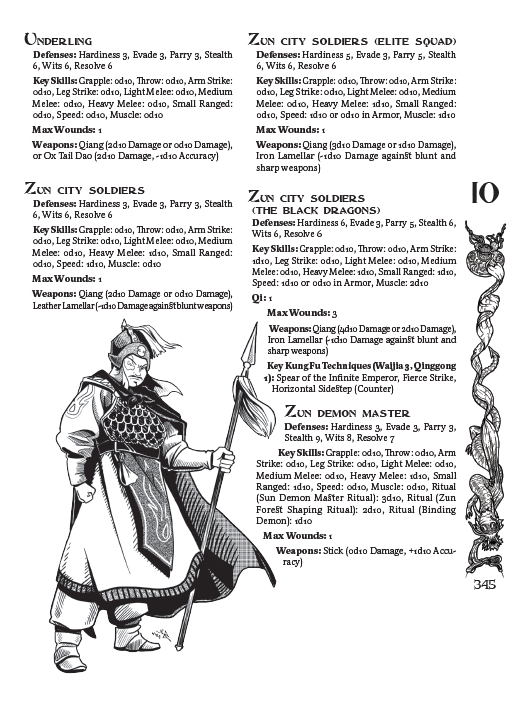 The game is built around individual Kung Fu Techniques and the rulebook has over 180 entries. Take techniques inspired by wuxia cinema and drama series such as Arms of Silk, Whirling Blade and the Perfect Strike of the Phoenix. 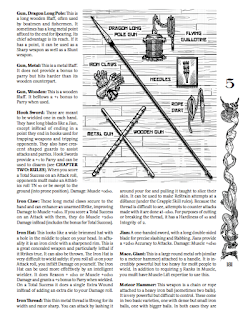 Fitting to the wuxia genre there is a wide range of weapons to select from. It includes everything from the classic gentlemen sword to the flying flying guillotine. 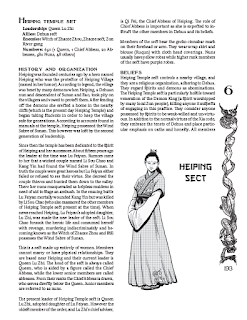 The characters and the martial sects are one of the most important things in a wuxia campaign. So we provide a number organizations and NPCs for the GM to use. 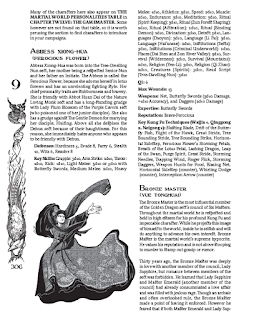 Players can start out belonging to one of the sects in the book if they wish. The game takes place in Qi Xien, a world of martial arts fantasy inspired by Song Dynasty China. It is a world of wuxia, but also of horror and the supernatural. The book includes everyday threats such as bandits and rival sects but also monstrous creatures. 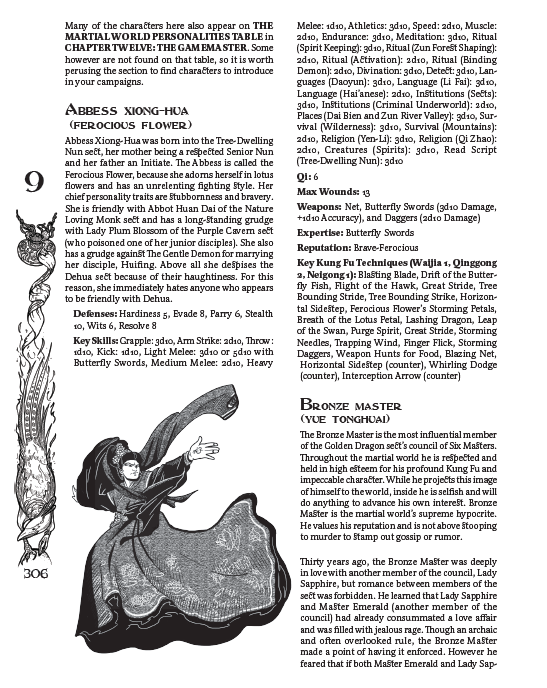 The Gamester section offers guidance on running and managing wuxia campaigns. Plus there is a sample adventure chapter. 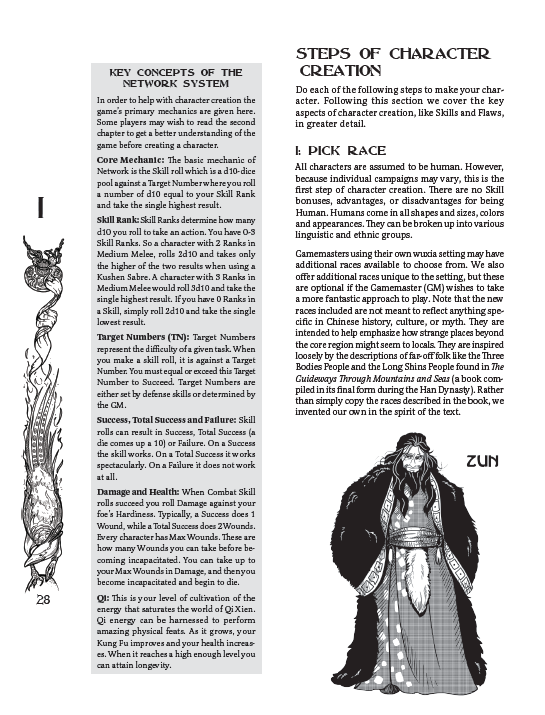 This is a sampling of Wandering Heroes of Ogre Gate. 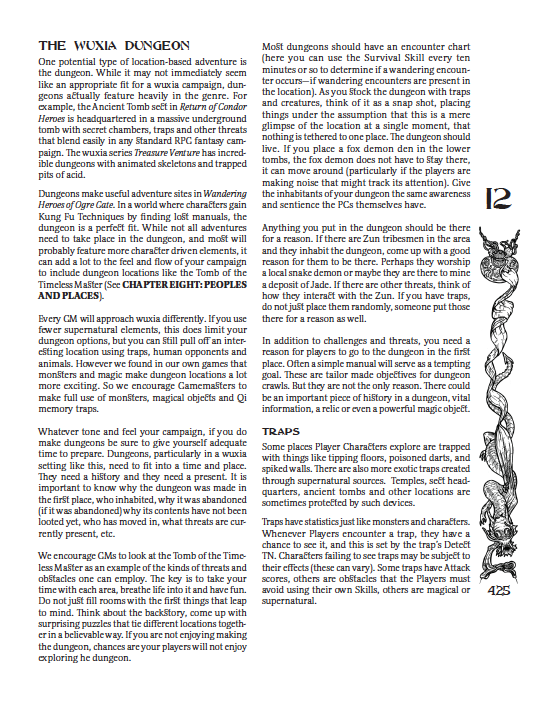 If you'd like to learn more check it out at RPGnow: HERE. Bao Yang awoke in a jail cell, imprisoned by Iron God Meng (who had just soundly defeated him in combat). Recognizing that Meng's skills were superior, he convinced Iron God Meng to take him as a disciple. He promised to be loyal and Iron God Meng agreed to the arrangement. He also proposed an alliance between Meng and Corpse Queen, which they would hammer out later. Between the two of them, Bao Yang figured they could control the martial world. Hidden Arrow, Shen Chun, Wei Ruomei and Li Sou Chao returned from the Hanging Valley of the Dead with the Ding Vessel of Yu and brought it to the House of Paper Shadows, where they were told Bone Breaker's body was awaiting resurrection. They entered the structure, an earthen round house with mazes of rooms and paper walls inside. A man greeted them, said his name was Shisan and he brought them to a private chamber where they could rest. He then took the Ding Vessel and said he'd perform the ritual himself. Several hours later, Fearless Cat entered their room. It became clear in the course of conversation that she, not Bone Breaker, had been resurrected, and that something about her personality had been changed by the process. She ate with them and instructed the group to find her son (who had been secreted away by Abbot Firebrand). They departed and joined with Bao Yang at Crocodile Sect Headquarters where the party exchanged news. They had heard rumors that Chao Feng went to Bone Breaking Fortress to retake their sect but was easily fended off by the usurper, Kang. However their information network told them that he had somehow managed to take the Immortal Killing Sword from them (this information was passed by someone still inside Bone Breaking sect and not Chao Feng himself). The next day they went north to Relentless Corpse Caverns and agreed to become Relentless corpse queen's subordinates (jointly under Iron God Meng). She was pleased with the arrangement and told them to arrange a meeting on a boat between her and Iron God Meng so the alliance they had discussed could be cemented. From there they went to Xuanlu to obtain an audience with Queen Ai Nu. The Temple of Jade Mercies (a kind of subsidiary of Crocodile Sect) was having trouble operating in Hai'an. They had to bribe their way in, but got an audience and the queen was amenable provided the party agreed to work with her as she needed, for any task that might arise. They then went north again to have the meeting between Relentless Corpse Queen and Meng. They secured a boat and the two met for some time. They agreed to call themselves the Golden Corpse Alliance and made the party their sub chiefs. They decided they would control the martial world from the shadows as a kind of invisible empire. The details were fuzzy but the goal was clear. Iron God Meng then appointed the party with a task. He had heard rumors that Master Guan had departed from his villa in Li Fan, taking his family to the Banyan to live in seclusion. According to the rumors, Guan left all his worldly belongings at his villa in the Yellow Forest, including the Bow of Gushan. He asked them to go and find what objects they could before others reached the villa. This was the second session of a new Wandering Heroes of Ogre Gate campaign. See the FIRST SESSION LOG to read about the previous session. 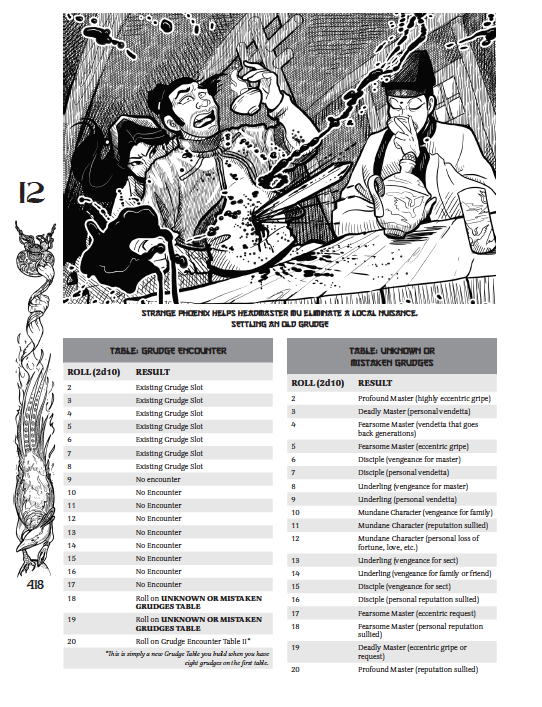 Ke-Yen and Pei went to the Sword and Wine Inn to prepare as they awaited their duel with Tiger Clan. There they met a performer named Shin Du who won them over by firing an arrow at an orange on a merchant cart (among many other antics). They invited him to join them in the fight against Tiger Clan but as they were talking, Xu An (a woman from Tiger Clan) leapt down from a roof and attacked with her butterfly swords. Sabres were crossed and a bloody fight ensued, as Xu An accused Ke-Yen of spreading rumors to divide her from her benefactor (Five-Dagger Chang). It ended with Xu An heavily wounded and in flight. Ke-Yen sought allies among the criminal networks in the city, eventually convincing the Dancing Scorpions to join and participate in the duel (because it would open up the Tiger's portion of the city to them). They gathered the heroes of Master Qian Bei's Water Sword School, the Dancing Scorpions and a one-armed physician named Song Pei, then went to the Yellow Forest to fight with the Tiger Clan. There they waited. Shin Du had manufactured some Divine Fire and prepared thunderbolt balls for use during the fight. Two figures approached, an old lady and a young man in chains with a slave brand named Zhendao. The woman announced herself as Five Dagger Chang's mother, and said Tiger Clan had sent its oldest and least respected to deal with them. Master Qien Bei insisted on fighting her in small groups out of fairness. A melee broke out and the thunderbolt balls went off, leaving both Granny Chang and Zhendao a bit bruised. Granny Chang threw daggers at all her attackers and Ke-Yen, Shin Du, Peng Pei and Song Pei were all incapacitated by the attack. However as Master Qien Bei and one of his students closed in, Zhendao stabbed Granny Chang in the back himself, killing her. He explained he was a slave and that he had been mistreated by Tiger Clan. The group helped to burn Granny Chang's body, and then treat the wounds of the fallen. When people were recovered enough, Ke-Yen spoke with the Dancing Scorpions, who had done nothing, and agreed to pay them for their troubles. They were satisfied and offered to do business in the future with her. 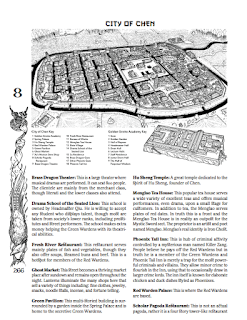 Zhendao told them that there had been a lot of strange activity at the sect headquarters, the Old Tiger Fortress, and they suspected that Tiger Clan had arranged the fight as a distraction for something bigger. They debated going south or going directly back to the city. At first they began heading south but were attacked by members of the Tiger Clan. They managed to kill them and decided to head directly to the city. There they saw wanted posters with the face and name of Abbot Yan (of the Temple of Sleeping Mercies). The posters said he was wanted for murder and robbery. They went to the magistrate and learned officials believed he had slaughtered his fellow monks at the temple, then taken the five million spades they'd deposited at the Yun Hu Bank (see previous session for details). They had one person jailed who had witnessed Abbot Yan leaving the temple with a bloody knife. Reluctantly the magistrate gave the heroes a moment with the witness to question him. They eventually learned that the man was instructed to lie by the head of his guild, Zhao Yi (a rice and pearl merchant). Outside they investigated in the city and visited the bank. Zhendao inspected the temple and found evidence of Five Dagger Chang's dagger strikes on the wall. They also learned that the gold might have been transported to a rice emporium on the canal. They found one where remnants of the original chests containing the gold were littered amid debris. The party then presented this evidence to Master Qien Bei, as he had proven to be helpful to them before. He reacted with surprise, saying that Zhao Yi was a well-known and well-respected man, and that for this reason, he also hesitated to take action. The party agreed that he need not intervene at the moment, but wanted to keep him apprised of the situation, and told him they would continue their investigation. Eventually they connected the emporium to Zhao Yi and inspected his residence. There they watched until they witnessed a messenger arrive and depart. Then they followed the messenger to the Sword and Wine Inn, where he met with Xu An. The party confronted Xu An in her room. Realizing she was outnumbered, and having been gravely wounded in their last exchange, she agreed to talk. She explained that Five Dagger Chang had fled to Hu Qin. She hinted that she might be willing to work against Tiger Clan if the party helped her become its leader. First however she said they would need the body of Granny Chang. Five Dagger had planned to build a shrine in her honor and would be expecting her body if she arrived in Hu Qin. They headed back to the Yellow Forest to get Granny Chang's remains. 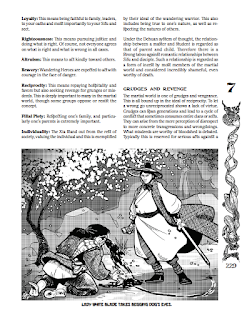 Wandering Heroes of Ogre Gate, Bedrock Game’s new wuxia RPG is available in PDF HERE. 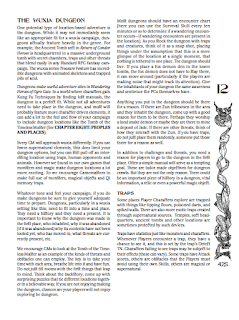 It is a complete RPG system and the PDF is pay-what-you-want (suggested price is 9.99). Enter a land of broken hearts and shattered bones, haunted by the legacy of the Demon Emperor. Find adventure and explore a wuxia-infused world of rival sects, blood-stained sabers, ancient manuals, and legendary kung fu masters. 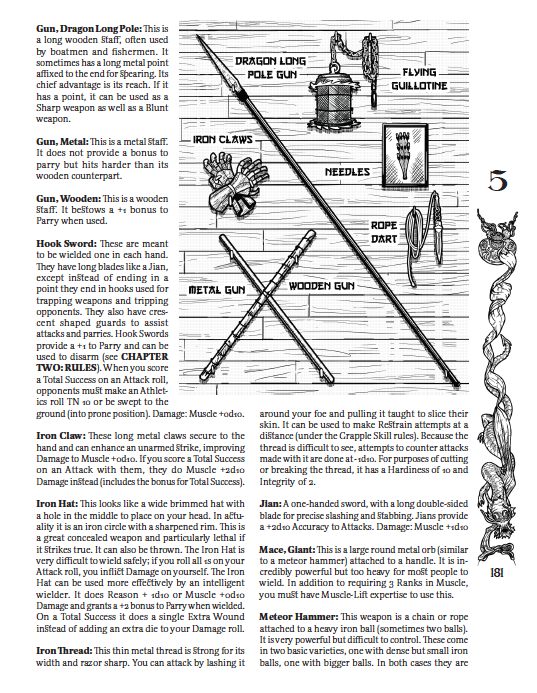 Born high or low, you are a martial hero who can channel internal energy into your weapon—be it a sword, fist, or flywhisk— with dazzling power. Bound across earth, treetop, air and water as you battle your foes. Learn secret kung fu techniques, how to strike at vital pressure points, perform powerful forbidden rituals or brew foul poisons. Face down roaming swordsmen, animal demons, evil officials, and the great masters of the age as your kung fu grows more profound. 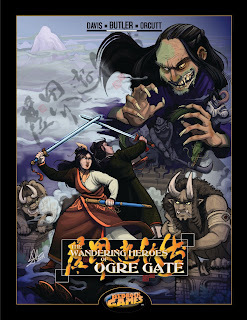 Wandering Heroes of Ogre Gate is a game of gravity-defying martial artists inspired by wuxia film and drama series. 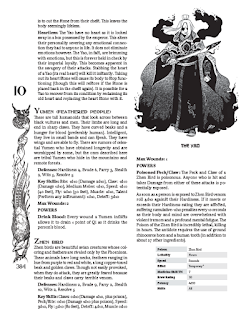 It comes with its own detailed martial arts fantasy setting inspired by Song Dynasty China but can be used in any Ancient Chinese or Wuxia campaign. Wandering Heroes of Ogre Gate uses the Network System and includes a full selection of martial sects. 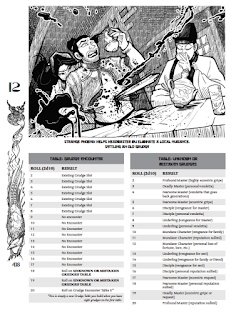 Over 180 Kung Fu Techniques are provided along with guidelines and tips for helping your game table to develop its own individual Kung Fu techniques and wuxia flavor.